Comprised of rotating band leaders, the T Blues Band is a nightly, sound-shifting, blues machine. Tight knit groups of 4 musicians combine forces to generate the most powerful and authentic blues incarnations around. Sit back, and enjoy! It's an experience you can't find anywhere else but Terra Blues. 04-THU JUSTIN HOWL ROBERT KIMBROUGH SR.
Born and raised in southern Mississippi, Justin Howl relocated to the middle American blues hub of Chicago in the early 2000's. Howl and his band The Salty Dogs have been a regular fixture in the Windy City since 2011 and Howl regularly takes his solo routine on tour. The bayou twinge never completely leaves his voice, and bulk of his materials are firmly rooted in the traditional pre-war blues of the south. Robert Kimbrough Sr. BluesConnection carries on in the Northern Mississippi tradtion made famous by his father, the legendary Junior Kimbrough. Robert’s deep-soul sound is a direct link to the Juke Joint Club and a continuation of the hypnotic rhythms and grooves of the Cotton Patch Soul Blues style. As a young musician, John Primer drew his first influences from his family's involvement with spiritual and gospel music. This early exposure, aided by the the sounds of Jimmy Reed, Muddy Waters, Little Milton, Elmore James, B.B. & Albert King, led to a fascination with the blues. True to the form of many bluesmen before him, Primer left Mississippi for Chicago where he played along side Sammy Lawhorn, Junior Wells, Buddy Guy, Smokey Smothers, Lonnie Brooks. His career did not have anywhere to go but up and he was taken on as an opening act for Muddy Waters. After Muddy's passing in 1983, Primer joined and toured with Magic Slim and the Teardrops until 1995 when he released his debut album The Real Deal. Ever since, this Grammy and W.C. Handy award nominee has been tearing up the world as front man of The Real Deal Blues Band! Raised in New York City, Ray Schinnery is known for his humorous originals, guitar mastery, and his unique "story-telling" voice. BLUES MAGAZINE wrote "just when you think his vocal is a standard, rough-hewn blues shouter, he turns around and lays down some of the shivery-sweetest 3 part harmonies this side of the bible belt". 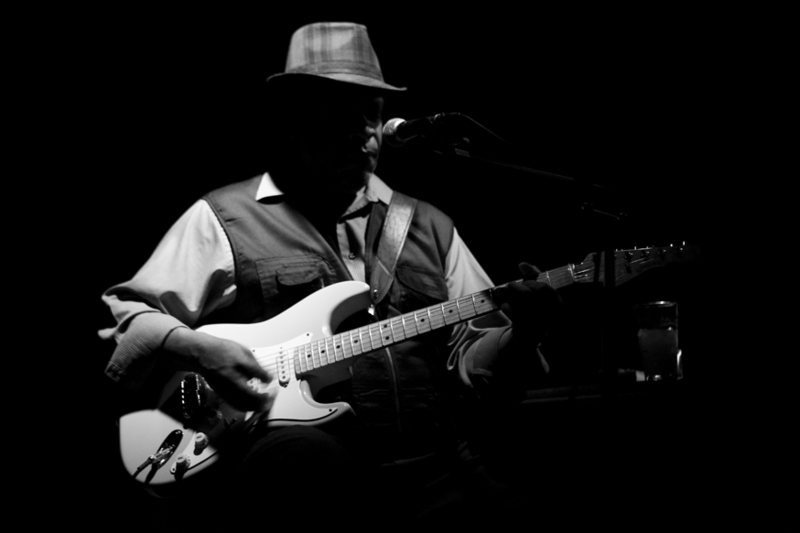 A regular on the international as well as the local blues scene, "with his band, a solo performer, or with his guitar, Ray is a master showman..."
A New Jersey native and self-taught guitarist, Jr Mack forged his own path into the heart of the blues. With the collected stage presence of a seasoned performer, Jr Mack lulls, mesmerizes, and reels the audience into a groove all his own. Having sat in or worked with The Allman Brothers Band, Robert Randolph, & many others, Junior Mack's soulful interpretation of the blues never fails to captivate. Irving Louis Lattin, another of Chicago's notable music exports, is one of the most desirable talents in the entertainment industry. Called upon for his song writing prowess and blues/funk performances, Lattin's sound has been featured in commercials (Covergirl, Chevy, Pfizers ... etc) and on stages across the world. Lattin began playing music at age 13 and by the time he was 25, mastered both composition and piano. Although you have probably heard Irving Louis Lattin during your every day life without even realizing it, wake up your consciousness and grab a featured show of his talented song writing and "real-thing" appeal right here at Terra Blues!